Our beloved long time sitter, Lee Anne, brought a batch of these memorable cookies to us years ago. 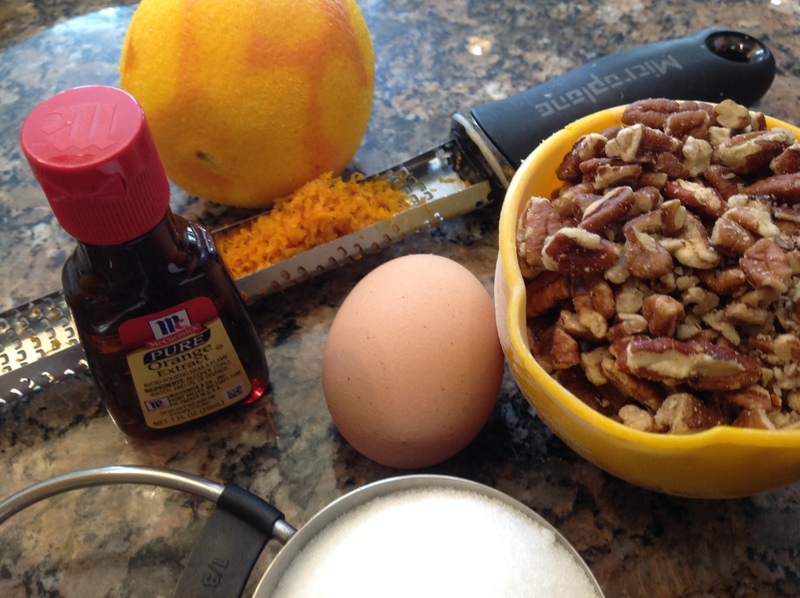 They are completely gluten free and made with 5 simple ingredients: chopped pecans, bold orange flavor coming from zest and orange extract, very little sugar and one egg white to bind the batter together. 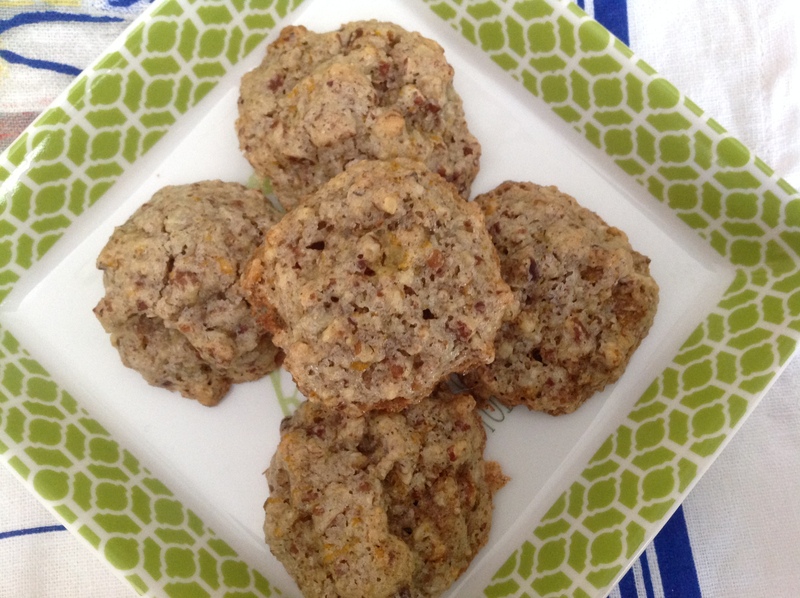 It is a healthy cookie that satisfies a sweet tooth without guilt. Even though our children are long past the years of needing a sitter, Lee Anne has been on my mind as she has become a mother herself this year. On her first Mother’s Day, she paid me the biggest compliment: that she had learned so much about raising children from my lessons and my kids. She even made one of my cakes to celebrate with her mom. Just in 6th grade when she came into our family, Lee Anne handled 3 rambunctious boys close in age like a pro with patience and love, for 10 years. She was my salvation from insanity more than once! The very embodiment of “It takes a village”. My children’s second mother. It has been so wonderful to see her become an accomplished professional woman and blossom as a mother herself. Which brings me back to these cookies. I paired them with a bright citrus salad of sliced oranges with a dusting of mint sugar straight from the garden. Such a fresh and easy dessert everyone loved. 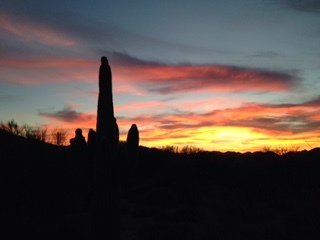 This post is for you, Lee Anne, with much gratitude and love. I can’t imagine motherhood will throw you any curveballs you can’t handle! Pulse pecans and sugar together in a food processor into a sand-like texture. 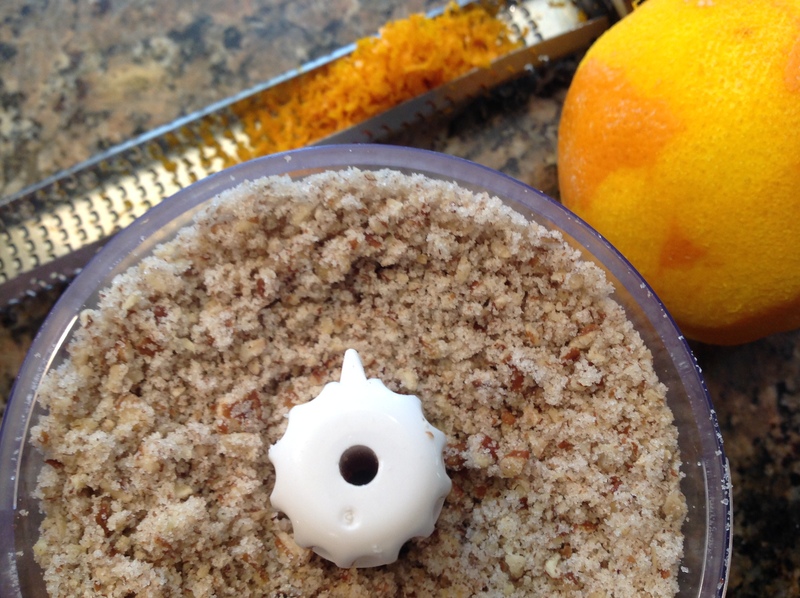 Transfer to a small bowl and add orange zest and extract. Gently fold in the egg white. Line a cookie sheet with parchment paper. 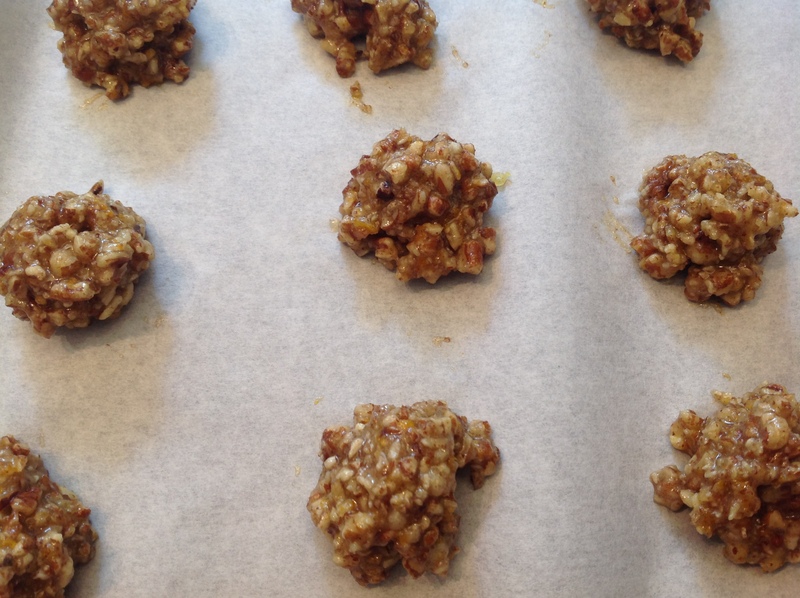 Drop 16 heaping teaspoons of dough onto the sheet 2 inches apart and shape into balls. Bake 8-10 minutes until edges are turning golden brown. Cool completely on sheet before handling. Dust with powdered sugar if desired.The cookies freeze well for up to 3 months. Hard to believe so few ingredients and no flour will be transformed into a tasty little cookie! In a mini food processor, pulse the mint and sugar together until it the texture is sand-like. 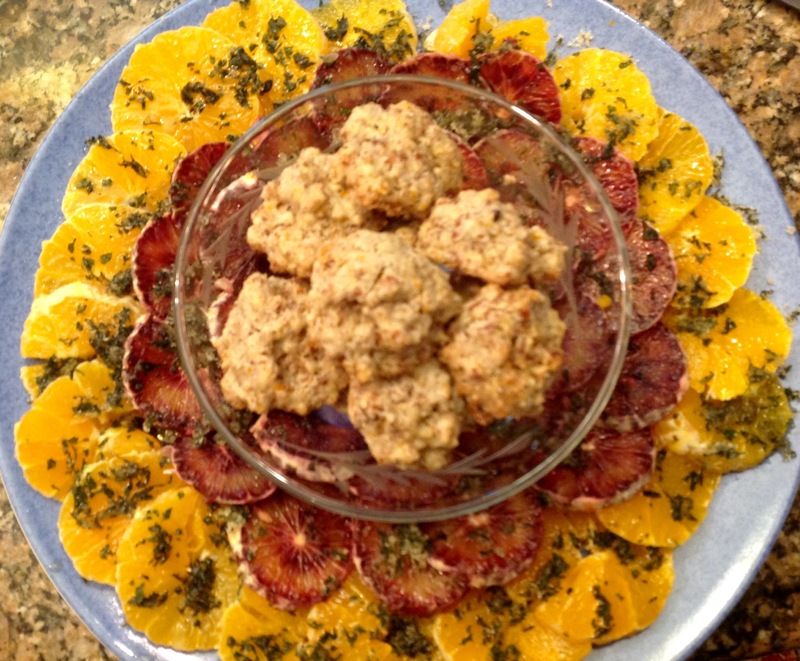 On a platter, arrange overlapping slices of oranges. Sprinkle with the mint sugar and serve. I sprinkled the mint sugar about an hour before serving the salad at room temperature. 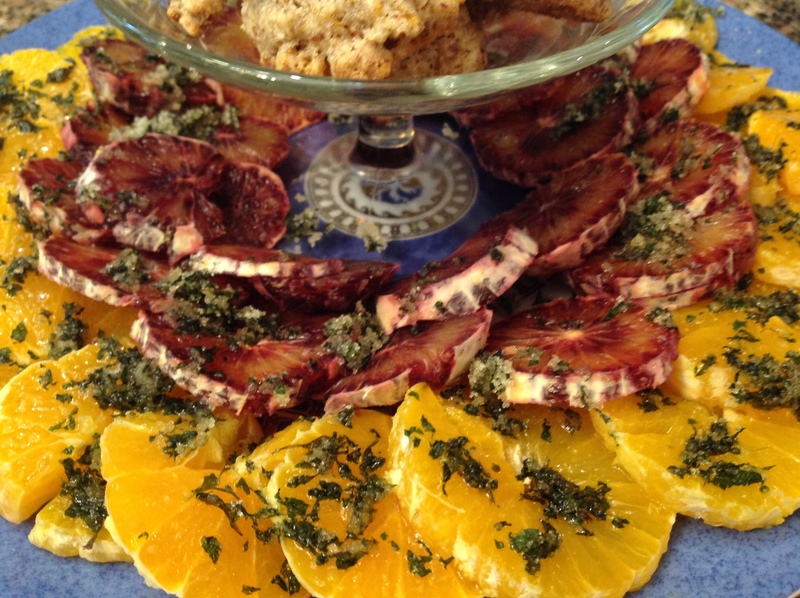 I used 5 medium tangelos and 6 small blood oranges for the salad photographed and served the salad with orange-pecan cookies. 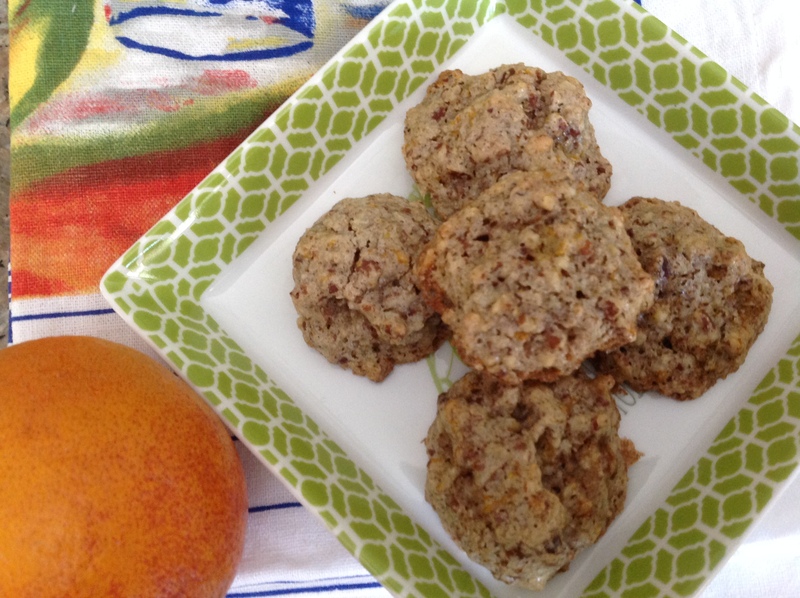 This entry was posted in Recipes and tagged Canyon Ranch Spa Orange Pecan Cookies, citrus salad with mint sugar, GF Orange Pecan Cookies by Johanne Lamarche. Bookmark the permalink. Johanne, you are making me cry. It is so like you to pay such glowing compliments to our special daughter who is now a mother too. I sent her the post asap but she is still digging out from a week off at office. She is so blessed with Charlotte. I do not want to leave the smiles, cuddles and games. Thank you again for your lavish words of praise for her service with your boys who are now fine young men. 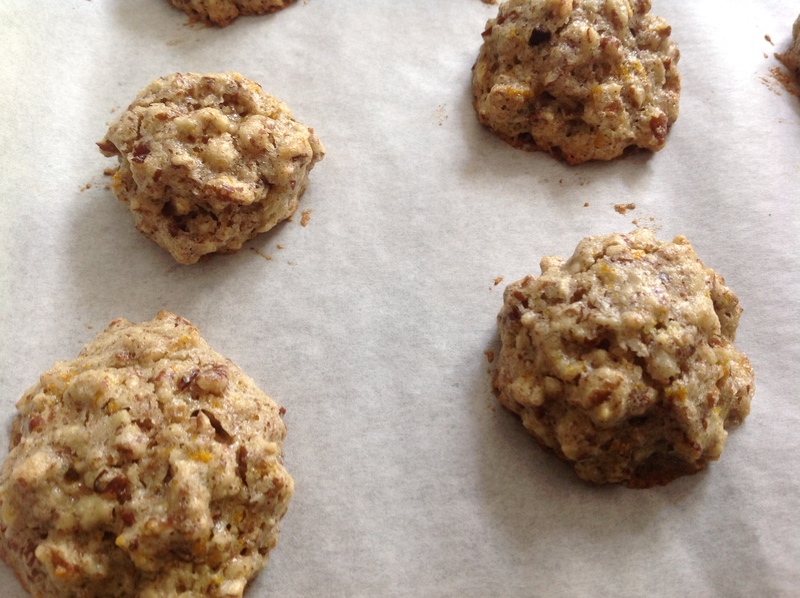 I can’t believe those cookies….not many ingredients, yet bursting with flavor. And that citrus salad so fresh and minty and spells summer Johanne. What a great dedication to your babysitter. If you try those cookies Loretta, you will be pleasantly surprised by all their orange flavor! They pack so much taste and texture and are so quick to throw together. Our sitter was a godsend in our lives and we have enjoyed becoming a part of her life too. Nice to hear from you Loretta. What a lovely idea for a light and refreshing treat. It is fun to watch special people in our lives grow up, how lucky you were to have such a helping hand! I will be trying these cookies! You will love them Jenna! The orange flavor surprises everyone who bites into one but eveyone raves about them. This is a great simply recipe that is low in sugar and fat and I just so appreciate your posting this one as I am trying my very best to get into my swimsuit from last year and need all the help I can get for my sweet tooth!! Hi Teresa! Always love hearing from you, especially when you make me laugh out loud. These are definitely skinny cookies so go ahead and indulge. Blogging about food is an occupational hazard for bathing suit season isn’t?